Identification and monitoring of business opportunites of exports of non-mining energy goods and services, international tourism, foreign direct investment abroad, in the markets or regions where ProColombia has coverage. 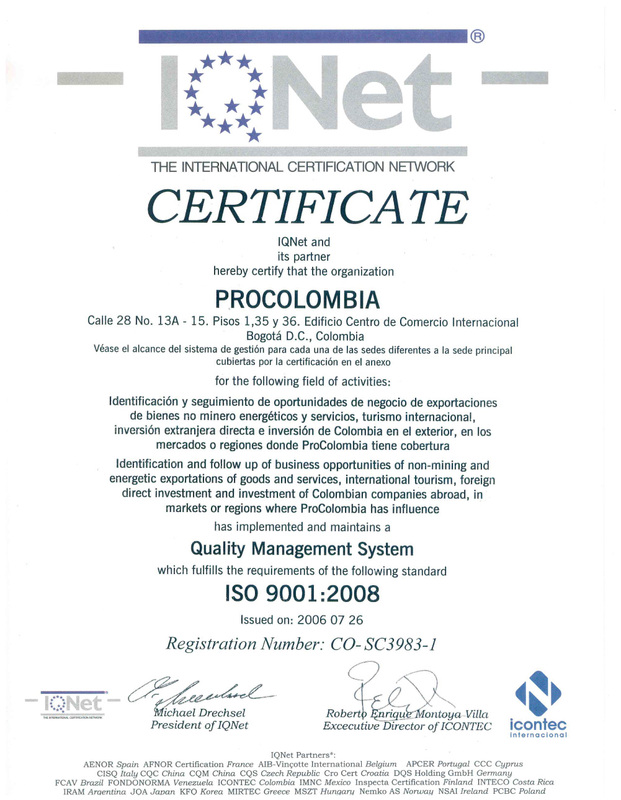 Keep an excellent level of quality in the provision of services and a culture of continuous improvement in line with government policies, to contribute to the positioning of Colombia abroad, promote exports of non-mining energy goods and services, the expansion of Colombian companies abroad, international tourism, foreign direct investment and Colombia Country Brand. 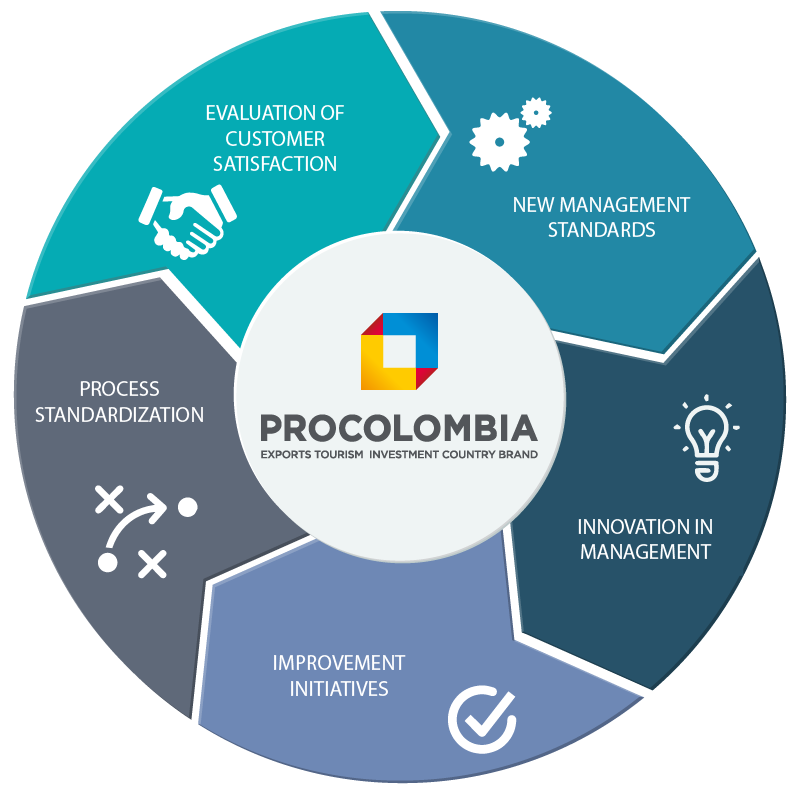 ProColombia manages the risks with the purpose of generating an organizational culture of continuous improvement to prevent events that may affect the fulfillment of strategic objectives and processes, being an integral part of the Quality Management System, in accordance with what is described in the Procedure of Risk management. The identification, analysis, assessment of risks and implementation of controls are the responsibility of the process leaders. The monitoring of the controls defined for risk management is the responsibility of the quality team, in order to keep the risk maps of each of the Quality Management System processes updated. The results obtained from the risk assessment will be presented in the Management Review to take actions aimed at eliminating the causes of the risks, keeping them under control or assuming them. Commitment 1: Be an Internally Sustainable Organization. Apply sustainability as a transversal tool in our organizational management and practice it as the axis of our operation, maintaining coherence between what is promoted and what is practiced and intervening in matters in which we have direct control, to manage and strengthen the Government Corporate, Transparency, Human Rights, Labor Practices and Suppliers and care for the Environment. Commmitment 2: Promote the sustainability as an attribute of competitiveness and differentiating element in Exports, Investment and Tourism. Identify the fundamental attributes of sustainability in sectors that ProColombia works and incorporate sustainability criteria in the processes of analysis and promotion of exports, investment and tourism, exerting an influence that allows the country to advance in the fulfillment of the commitments it has assumed in this matter and of Suppliers and care for the Environment. Commitment 3: Promote sustainability issues from the construction of information, the implementation of communication strategies and the definition of Colombia Country Brand attributes.Incorporate sustainability issues into the analysis, construction, segmentation and dissemination of information, in such a way that they contribute to the strengthening of training and awareness spaces and that proactively identify opportunities and niche markets that incorporate sustainability as a cross-cutting tool management. As well as developing integral communication strategies for the sustainability, image and attributes of Colombia Country Brand. Promote investment and facilitate the knowledge for foreign investors, get them to visit and invest in Colombia in all sectors, and with special interest in those who generate a productive transformation in the country. Promote Colombia as a tourist destintation for holidays and meetings so international travelers visit Colombia and organice their international events in the country. Promote Colombia as a supplier of non-mining energy goods and services in international markets, in accordance with the demand, through the expansion of colombian companies abroad, formation programs, adequacy of the exportable offer and promotion activities. Contribute to the Colombia Country Brand positioning and the disclosure of national wealth and national values.